Nickname: "Big D," "D-Town," "The 214"
Dallas is the third-largest city in Texas, after Houston and San Antonio. It is and the ninth-largest city in the United States, located in the north-central part of the state, near the junction of the Trinity River's three forks. The region is comprised of prairie, tree-lined creeks and rivers, and rolling hills. Dallas was founded in 1841 and formally incorporated in 1856. Dallas is the main economic center of the 12 county Dallas, Fort Worth, Arlington metropolitan area. With 6.1 million people, it is the fourth-largest metropolitan area in the United States. The city's economy is today primarily based on banking, commerce, telecommunications, computer technology, energy, and transportation. 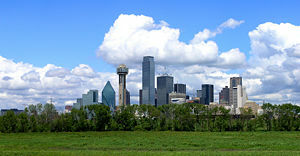 Dallas is at the center of the largest inland metropolitan area in the United States. It lacks any navigable link to the sea. The city's prominence comes from its historical importance as a center for the cotton and oil industries, its position along numerous railroad lines, and its status as a strong industrial and financial sector. Today it is a cosmopolitan city, well-known for its cultural activities, including ballet, opera, musicals, and symphony. It is ethnically diverse, with less than half its population being of European descent. About one-fourth of the residents are of African descent, and more than one-third are of Hispanic origin. Dallas gained international attention as the city in which U.S. President John F. Kennedy was assassinated on November 22, 1963 as he rode in a motorcade through the downtown area. 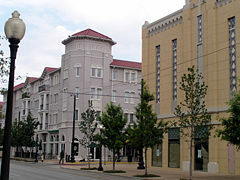 Dealey Plaza, in the historic West End district of downtown Dallas, was named a National Historic Landmark in 1993 as the location of the assassination. Dallas is the county seat of Dallas County. Portions of the city extend into neighboring Collin, Denton, Kaufman, and Rockwall counties. According to the United States Census Bureau, the city has a total area of 385 square miles (997.1 km²). Dallas makes up one-fifth of the much larger urbanized area known as the Dallas/Fort Worth Metroplex, in which one-quarter of all Texans live. Dallas and its surrounding area are mostly flat; the city itself lies at elevations ranging from 450 feet (137 m) to 550 feet (168 m). Dallas, like many other cities in the world, was founded along a river, in this case at a ford of the Trinity River, where it was easier for wagons to cross in the days before ferries or bridges. The Trinity River, though not usefully navigable, is the major waterway through the city. The river is flanked on both sides by 50 feet (15 m) tall earthen levees to protect the city from frequent floods. Since it was rerouted in 1908, the river has been little more than a drainage ditch within a floodplain for several miles above and below downtown Dallas, with a more normal course farther upstream and downstream. But as Dallas began shifting toward a postindustrial society, public outcry about the lack of aesthetic and recreational use of the river ultimately gave way to the Trinity River Project, which is scheduled to be completed in the 2010s. If the project materializes fully, it promises improvements to the riverfront in the form of man-made lakes, new park facilities and trails, and transportation upgrades. White Rock Lake, a reservoir constructed at the beginning of the twentieth century, is Dallas's other significant water feature. The lake and surrounding park are a popular destination among boaters, rowers, joggers, and bikers, as well as visitors seeking peaceful respite from the city at the 66-acre (267,000 m²) Dallas Arboretum and Botanical Garden, located on the lake's eastern shore. Dallas has a humid subtropical climate, though it is located in a region that tends to receive warm, dry winds from the north and west in the summer, bringing temperatures well over 100 °F (38 °C) at times and heat-humidity indexes soaring as high as 117 °F (47 °C). Winters are generally mild, with typical daytime highs between 55 °F (13 °C) and 70 °F (21 °C) and nighttime lows between 35 °F (2 °C) and 50 °F (10 °C). However, strong cold fronts known as "Blue Northers" sometimes pass through Dallas. Snowfall is seen on average 2–4 days of the year, and snow accumulation is typically seen at least once every winter. Daytime highs above 65 °F (18 °C) are not unusual during the winter season. Spring and autumn bring pleasant weather. Vibrant wildflowers (such as the bluebonnet and Indian paintbrush) are planted along the highways throughout Texas and bloom in the spring. Springtime weather can be quite volatile, but temperatures themselves are mild. The weather is also generally pleasant between late September and early December. In the spring, cool fronts moving south from Canada collide with warm, humid air streaming in from the Gulf Coast. When these fronts meet over north-central Texas, severe thunderstorms are generated with spectacular lightning shows, torrents of rain, hail, and occasionally, tornadoes. The city's all-time recorded high temperature is 113°F (45°C), while the all-time recorded low is -2°F (-18.9°C). Dallas receives approximately 37.1 inches (942.3 mm) of rain per year. Central Dallas is anchored by Downtown, the center of the city and the epicenter of urban revival, along with Oak Lawn and Uptown, areas characterized by dense retail, restaurants, and nightlife. Southwest of Downtown lies Oak Cliff, a hilly area that has undergone gentrification in recent years in neighborhoods such as the Bishop Arts District. Oak Cliff originated as a township founded in the mid-1800s and was annexed by the city of Dallas in 1903. Today, most of the area's northern residents are Hispanic. South Oak Cliff, on the other hand, became predominantly African American after the early 1970s. Much of the southern portion of the city has struggled with high rates of poverty and crime. South Dallas, a distinct neighborhood southeast of Downtown, lays claim to the Cedars, an eclectic artist hotbed south of downtown, and Fair Park, home of the annual State Fair of Texas. The area is arguably the poorest in the city. While Oak Cliff is mostly lower-income but fairly vibrant, South Dallas contains large numbers of boarded-up buildings and vacant lots. To spur growth in the southern sector of the city, University of North Texas opened a Dallas campus in 2006 in south Oak Cliff. Large amounts of undeveloped land remain nearby, due to decades of slow growth. Farther east, in the southeast quadrant of the city, is the large neighborhood of Pleasant Grove. Once an independent city, it is a collection of mostly lower-income residential areas. Though a city neighborhood, Pleasant Grove is surrounded by undeveloped land on all sides, including swampland separating it from South Dallas that will in the future be part of the Great Trinity Forest, a subsection of the city's Trinity River Project. 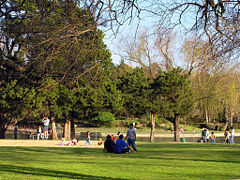 Dallas includes three enclaves within the city boundaries—Cockrell Hill, Highland Park, and University Park, each a municipality with its own government. Before Texas was claimed in the sixteenth century as a part of New Spain by the Spanish Empire, the Dallas area was inhabited by the Caddo Native American tribe. Later, France also claimed the area, but in 1819 the Adams-Onís Treaty made the Red River the northern boundary of New Spain, placing Dallas well within Spanish territory. The area remained under Spanish rule until 1821, when Mexico declared independence from Spain and the area became part of the Mexican state of Coahuila y Tejas. In 1836, the Republic of Texas broke off from Mexico to become an independent nation. In 1839, Warren Angus Ferris surveyed the area around present-day Dallas. Two years later, John Neely Bryan established the permanent settlement that later became the city of Dallas. The Republic of Texas was annexed by the United States in 1845, and Dallas County was established the following year. It is uncertain whether the city was named after George Mifflin Dallas, the U.S. vice president under James K. Polk. The assassination of John F. Kennedy, the thirty-fifth president of the United States, took place on November 22, 1963, in Dallas. Kennedy was fatally wounded by gunshots while riding with his wife Jacqueline Bouvier Kennedy in a presidential motorcade. The city uses a council-manager government, with a mayor, a city manager, and 14 council members serving as representatives to the 14 council districts in the city. This organizational structure was recently contested by some in favor of a strong-mayor city charter, only to be rejected by Dallas voters. The United States District Court for the Northern District of Texas, which exercises original jurisdiction over 100 counties in north and west Texas, convenes in the Earle Cabell Federal Building and Courthouse. The same building houses United States Bankruptcy and Magistrate Courts and a United States Attorney office. Dallas also is the seat of the Fifth Court of Appeals of Texas. In terms of voting patterns, the Dallas-Fort Worth Metroplex is the third most liberal of the Texas metropolitan areas after Austin and El Paso. In contrast, 54 percent of Houston- and San Antonio-area voters and an even higher percentage of rural Texan voters are conservative. As a city, Dallas can be seen as moderate, with conservative Republicans dominating the upper-middle class suburban neighborhoods of North Dallas and liberal Democrats dominating neighborhoods closer to Downtown as well as the city's southern sector. As a continuation of its suburban northern neighborhoods, Dallas's northern suburbs are overwhelmingly conservative. Plano, the largest of these suburbs, was ranked as the fifth most conservative city in America. However, the city of Dallas (excluding its suburbs) generally votes for Democratic political candidates in local, state, and national elections. In the 2004 U.S. presidential elections, 57 percent of Dallas voters voted for John Kerry over George W. Bush. By the 2008 elections, both Dallas County and the city of Dallas had become overwhelmingly Democratic. In Dallas County as a whole, 57 percent of voters chose Barack Obama, compared to the 42 percent who chose John McCain. The city of Dallas favored Obama over McCain by an even larger margin, 65 percent to 35 percent. Bucking the city's Democratic trend, conservative Republican Tom Leppert defeated liberal Democrat Ed Oakley in the city's 2007 mayoral race by a margin of 58 percent to 42 percent. Had Oakley been elected, he would have become the first openly gay mayor of a large U.S. city. Though candidates' political leanings are well publicized in the media, Dallas's elections are officially non-partisan. In its beginnings, Dallas relied on farming, neighboring Fort Worth's cattle market, and its prime location on Indian trade routes to sustain itself. Dallas's key to growth came in 1873 with the building of multiple rail lines through the city. As Dallas grew and technology developed, cotton became its boon, and by 1900, Dallas was the largest inland cotton market in the world, becoming a leader in cotton gin machinery manufacturing. By the early 1900s, Dallas was a hub for economic activity all over the Southwest and was selected in 1914 as the seat of the Eleventh Federal Reserve District. By 1925, Texas churned out more than one-third of the nation's cotton crop, with 31 percent of Texas cotton produced within a 100-mile (161 km) radius of Dallas. In the 1930s, oil was discovered east of Dallas near Kilgore, Texas. Dallas's proximity to the discovery put it immediately at the center of the nation's oil market. Oil discoveries in the Permian Basin, the Panhandle, the Gulf Coast, and Oklahoma in the following years further solidified Dallas's position as the hub of the market. The end of World War II left Dallas seeded with a nexus of communications, engineering, and production talent by companies such as Collins Radio Corporation. Decades later, the telecommunications and information revolutions still drive a large portion of the local economy. The city is sometimes referred to as the heart of "Silicon Prairie" because of a high concentration of telecommunications companies in the region, the epicenter of which lies along the Telecom Corridor, home to more than 5700 companies. The Corridor is home to Texas Instruments and regional offices for Alcatel Lucent, AT&T, Ericsson, Fujitsu, Nokia, Rockwell, Cisco Systems, Sprint, and Verizon, as well as the national offices of CompUSA and Nortel. In December 2007, Ontario's Research in Motion (RIM), makers of the BlackBerry handheld computer, announced Irving as the site of its U.S. headquarters. In the 1980s, Dallas was a real estate hotbed, with the metropolitan population skyrocketing and the concurrent demand for housing and jobs. Several of Downtown Dallas's largest buildings are the fruit of this boom, but over-speculation and the savings and loan crisis prevented any further additions to Dallas's skyline. Between the late 1980s and the early 2000s, central Dallas went through a slow period of growth and has only recently bounced back. This time, the real estate market in the Dallas-Fort Worth Metroplex has proven to be much more resilient than those of most other parts of the United States. Dallas is no longer a hotbed for manufacturing like it was in the early twentieth century, but plenty of goods are still manufactured in the city. Texas Instruments employs 10,400 people at its corporate headquarters and chip plants in neighboring Richardson, and defense and aircraft manufacturing still dominates the economy of nearby Fort Worth. The Dallas-Fort Worth Metroplex as a whole has the largest concentration of corporate headquarters in the United States. New additions to the list include AT&T, which announced plans in June 2008 to relocate its corporate headquarters to Downtown Dallas from San Antonio, and Comerica Bank, which relocated in 2007 from Detroit. Suburban Irving is home to four Fortune 500 companies of its own, including Exxon Mobil, the most profitable company in the world and the second largest by revenue, Kimberly-Clark, Fluor (engineering), and Commercial Metals. Additional companies internationally headquartered in the Metroplex include Southwest Airlines, American Airlines, RadioShack, Neiman Marcus, 7-Eleven, Brinker International, id Software, ENSCO Offshore Drilling, Mary Kay Cosmetics, CompUSA, Zales and Fossil. Corporate headquarters in the northern suburb of Plano include EDS, Frito Lay, Dr Pepper, Snapple, and JCPenney. The city is home to 15 billionaires, placing it ninth worldwide among cities with the most billionaires. The ranking does not take into account the eight billionaires who live in the neighboring city of Fort Worth. The most notable event held in Dallas is the State Fair of Texas, which has been held annually at Fair Park since 1886. The fair is a massive event, bringing in an estimated $350 million to the city's economy annually. Like many other major cities in the United States, the primary mode of local transportation in Dallas is the automobile, though efforts have been made to increase the availability of alternative modes of transportation, including the construction of light rail lines, biking and walking paths, wide sidewalks, a trolley system, and buses. Dallas is served by two commercial airports: Dallas/Fort Worth International Airport (DFW) and Dallas Love Field (DAL). As of the 2000 census, there were 1,188,580 people, 451,833 households, and 266,580 families residing in Dallas proper. The population density was 3,469.9 people per square mile (1,339.7/km²). There were 484,117 housing units at an average density of 1,413.3 per square mile (545.7/km²). The racial makeup of Dallas was 35.32 percent white, 40.88 percent African American, 4.5 percent Asian, 1 percent Native American, 0.50 percent Pacific Islander, 14.92 percent from other races, and 5.3 percent from two or more races. 30.2 percent of the population was Hispanic or Latino of any race. Hispanics outnumbered African-Americans for the first time in the 2000 census as the largest minority group in Dallas. The city has historically been predominantly white, but its population has diversified as it has grown in size and importance over the twentieth century to the point that non-Hispanic whites now represent only one-third of the city's population. In addition, almost 25 percent of Dallas's population and 17 percent of residents in the Metroplex as a whole are foreign-born. Dallas is a major destination for Mexican immigrants, both legal and illegal. The southwestern and southeastern portions of the city, particularly Oak Cliff and Pleasant Grove, consist of a mixture of black and Hispanic residents, while the southern portion of the city is predominantly black. North Dallas, on the other hand, is mostly white, though many enclaves of predominantly black and Hispanic residents exist. In addition, Dallas and its suburbs are home to a large number of Asian American residents—Korean, Taiwanese, Chinese, Filipino, Vietnamese, Indian, Bangladeshi, Pakistani, and Arab all have large presences in the area, particularly in the suburbs of Garland, Richardson, Plano, Carrollton, Irving, Arlington, Frisco, and Allen. About half of Dallas's population was born outside of Texas. Many residents have migrated to the city from other parts of the country, particularly the Midwest, Northeast, and other Sunbelt states such as California. There is a large Protestant Christian influence in the Dallas community, as the city is deep within the Bible Belt. Methodist and Baptist churches are prominent in many neighborhoods and anchor two of the city's major private universities (Southern Methodist University and Dallas Baptist University). The Cathedral of Hope, a lesbian, gay, bisexual, and transgender Protestant church, is the largest congregation of its kind in the world. The city is also home to a sizable Mormon community, which led the Church of Jesus Christ of Latter-day Saints to build a major temple in the city in 1984. 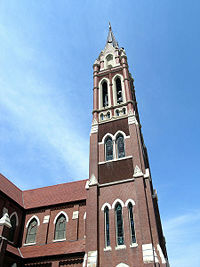 The Catholic Church is a significant organization in the Dallas area and operates the University of Dallas, a liberal-arts university in the Dallas suburb of Irving. Across the street from the university is one of only 13 Cistercian Abbeys in the United States and the only one that operates a private preparatory school as well. The Cathedral Santuario de Guadalupe in the Arts District oversees the second-largest Catholic church membership in the United States, with 70 parishes in the Dallas Diocese. Dallas is also home to three Eastern Orthodox Christian churches. Further, a large Muslim community lives in the north and northeastern portions of Dallas, as well as in the northern Dallas suburbs. The oldest mosque in Texas is located in Denton, about 40 miles (64 km) north of Downtown Dallas. Dallas and its surrounding suburbs also have one of the largest Jewish communities in the United States, most of whom reside in North Dallas. Temple Emanu-El, the largest synagogue in the region, was founded in 1873. Dallas also has a large Buddhist community. Immigrants from Thailand, Laos, Cambodia, Vietnam, Nepal, Tibet, Japan, China, Taiwan, and Sri Lanka have all contributed to the Buddhist population, which is concentrated in the northern suburbs of Garland and Richardson. The Arts District in the northern section of Downtown is home to several arts venues, both existing and proposed. Notable venues in the district include the Dallas Museum of Art, the Morton H. Meyerson Symphony Center, The Trammell & Margaret Crow Collection of Asian Art, the Nasher Sculpture Center, The Dallas Contemporary, and the Dallas Children's Theatre. Deep Ellum, immediately east of Downtown, originally became popular during the 1920s and 1930s as the prime jazz and blues hot spot in the South. Today, Deep Ellum is home to hundreds of artists who live in lofts and operate in studios throughout the district alongside bars, pubs, and concert venues. Dallas has numerous local newspapers, magazines, television stations and radio stations that serve the Dallas/Fort Worth Metroplex as a whole, which is the fifth-largest media market in the United States. Dallas has one daily newspaper, The Dallas Morning News. Other daily newspapers are Al Día, a Spanish-language paper; Quick, a free, summary-style version of the Morning News; the Jewish community's Texas Jewish Post; and a number of ethnic newspapers. In terms of the larger metro area, the Fort Worth Star-Telegram is another significant daily newspaper, covering Fort Worth/Tarrant County and other suburban areas to the west and northwest of Dallas. It also publishes a major Spanish-language newspaper for the entire Metroplex known as La Estrella. Hispanic Broadcasting Corporation (HBC), the largest company in the Spanish language radio station business, is based in Dallas. In 2003, HBC was acquired by Univision and became Univision Radio Inc., but the radio company remains headquartered in the city. Dallas is home to the Dallas Desperados (Arena Football League), Dallas Mavericks (National Basketball Association), and Dallas Stars (National Hockey League). 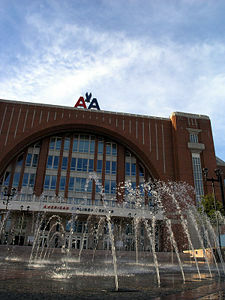 All three teams play at the American Airlines Center. Nearby Irving is home to the Dallas Cowboys of the National Football League. 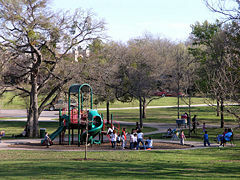 The City of Dallas maintains and operates 406 parks on 21,000 acres (85 km²) of parkland. Its flagship park is the 260-acre (1.05 km²) Fair Park, which hosted the Texas Centennial Exposition in 1936. The city is also home to Texas' first and largest zoo, the 95 acres (0.38 km²) Dallas Zoo, which opened at its current location in 1888. 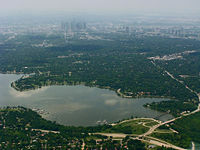 The city's parks contain 17 separate lakes, including White Rock and Bachman lakes, spanning a total of 4,400 acres (17.81 km²). In addition, Dallas is traversed by 61.6 miles (99.1 km) of biking and jogging trails, including the Katy Trail, and is home to 47 community and neighborhood recreation centers, 276 sports fields, 60 swimming pools, 232 playgrounds, 173 basketball courts, 112 volleyball courts, 126 play slabs, 258 neighborhood tennis courts, 258 picnic areas, six 18-hole golf courses, two driving ranges, and 477 athletic fields. To the west of Dallas in Arlington is Six Flags Over Texas, the original franchise in the Six Flags theme park chain. Hurricane Harbor, a large water park owned by Six Flags, is also in Arlington. College football game - The University of Texas Longhorns vs. the Oklahoma Sooners in the 101st Red River Shootout, October 7, 2006. There are 337 public schools, 89 private schools, 38 colleges, and 32 libraries in Dallas. Most neighborhoods in the city of Dallas are located within the Dallas Independent School District, the 12th-largest school district in the United States. The school district operates independently of the city and enrolls over 161,000 students. There are also many private schools in Dallas. A few areas of Dallas also extend into other school districts. Many school districts in Dallas County, including Dallas ISD, are served by a governmental agency called Dallas County Schools. The system provides busing and other transportation services, access to a massive media library, technology services, strong ties to local organizations for education/community integration, and staff development programs. The University of Texas Southwestern Medical School is a medical school that is part of the University of Texas Southwestern Medical Center at Dallas, one of the largest groupings of medical facilities in the world. The school is very selective, admitting only around 200 students a year. The facility is home to four Nobel Laureates—three in physiology/medicine and one in chemistry. At the two-year level, the Dallas County Community College District has seven campuses located throughout the area, with branches in Dallas as well as the surrounding suburbs. 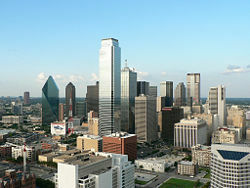 Dallas is a major center of education for much of the south-central United States. In addition to those located in the city, the surrounding area also contains a number of universities, colleges, trade schools, and other educational institutions. 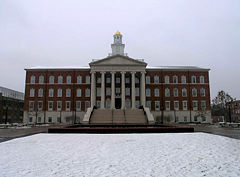 Southern Methodist University (SMU) is a private, coeducational university in University Park, an independent city that, together with the adjacent town of Highland Park, is entirely surrounded by Dallas. The University of Texas at Dallas, part of the state public university system, is located in the city of Richardson, adjacent to Dallas. The University of Dallas, in the suburb of Irving, is an enclave of traditional Roman Catholicism in the mostly Protestant religious landscape of Dallas. Dallas Baptist University, located in southwestern Dallas County, is a premier school for Baptists worldwide. Also in the nearby suburbs and neighboring cities are the University of North Texas and Texas Woman's University in Denton, as well as the University of Texas at Arlington. Fort Worth also has two major universities within its city limits, Texas Christian University and Texas Wesleyan University. A number of colleges and universities are also located outside the immediate metropolitan area. The Trinity Project area will reach for over 20 miles (32 km) in length within the city, while the overall geographical land area addressed by the Land Use Plan is approximately 44,000 acres (180 km²) in size—about 20 percent of the land area in Dallas. Green space along the river will encompass approximately 10,000 acres (40 km²), making it one of the largest and most diverse urban parks in the world. According to the American Lung Association, Dallas has the 12th highest ozone air pollution in the nation, ranking it behind Los Angeles and Houston. Much of the air pollution in Dallas, and the Metroplex in general, comes from a hazardous materials incineration plant in the small town of Midlothian, as well as concrete installations in neighboring Ellis County. Another major contributor to air pollution in Dallas are automobiles. Due to the area's spread-out nature and high amount of urban sprawl, automobiles are the only viable mode of transportation for many. ↑ U.S. Census Bureau, Population Division (February 17, 2010). Population Estimates, Accepted Challenges to Vintage 2007 Estimates. Retrieved February 17, 2010. ↑ Luisa Kroll and Allison Fass, March 8, 2007, The World's Billionaires Forbes. Retrieved December 3, 2008. ↑ U.S. Census Bureau. 2006 American Community Survey Data Profile Highlights Retrieved December 3, 2008. ↑ Onboard Informatics. Dallas, Texas Retrieved December 3, 2008. Bolton, Herbert E. 1914. Athanase de Mezieres and the Louisiana-Texas Frontier 1768-1780. Cleveland: Arthur H Clark Company. Rogers, John William. 1951. The lusty Texans of Dallas. (Society in America series.) New York: Dutton. This page was last modified on 17 November 2017, at 16:54.